"Follow the Raleigh Is Cool crew on twitter"
Little Hen Restaurant in Holly Springs will host a Western Wake Farmers’ Market night on Monday, September 8, 2014. A portion of the proceeds will benefit WWFM. Little Hen offers fresh, local farm-to-table cuisine and “supports local farms and farmers’ markets by putting onto your plate what is fresh, seasonal, and as far as possible, devoid of all that mass production has created.” Come support local food and farm-to-table restaurants! The WWFM is open year-round, rain or shine, to provide area residents with access to locally grown and crafted foods. Market offerings include fresh seasonal produce, flowers, herbs, baked goods, prepared foods, eggs, cheeses, meats and seafood, as well as coffee, beer, soda, local honey, crafts and more. The mission of WWFM is for all people in our community to become educated about and benefit from locally grown food. Our aim is to helpall walks of life, from the farmers to the local community members to those less fortunate who might need assistance through the local food bank. The seventh annual Raleigh Easter returns to the capital city on Saturday, April 12, a week earlier than normal this year. 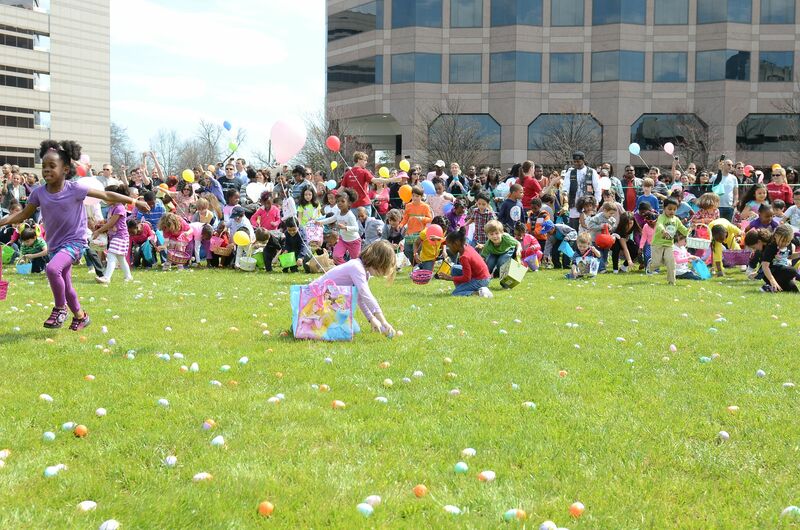 This year, thousands of visitors to this FREE event on Raleigh’s Halifax Mall will find more than 58,000 eggs in more than a half dozen egg hunts from 10 a.m. through 1 p.m. Visitors will also enjoy games, music, balloons, and inflatables as part of the day’s festivities. Last year’s crowd saw more than 4,000 children participate in egg hunts on Halifax Mall, located in the Government Complex one block north of the state legislative building (near the Museums of Natural Sciences and History) in Downtown Raleigh. Hunts will take place every half hour between 10 a.m. and 1 p.m. this year, with separate zones for children with special needs. Raleigh Easter is sponsored by Vintage Church, a non-denominational church with three locations in the Triangle. Although Raleigh Easter isn’t a religious event, the church has scheduled Easter services, beginning with a Maundy Thursday celebration on April 17 at 7 p.m. and Easter Sunday services at 9 a.m., 10:30 a.m., 11:30 a.m., and 5 p.m. (see www.vintagenc.com for service locations). For more information about Raleigh Easter, visit www.raleigheaster.com, or contact Jessica Janes at Jessica.Janes@vintagenc.com or by phone at (919) 740-0518. 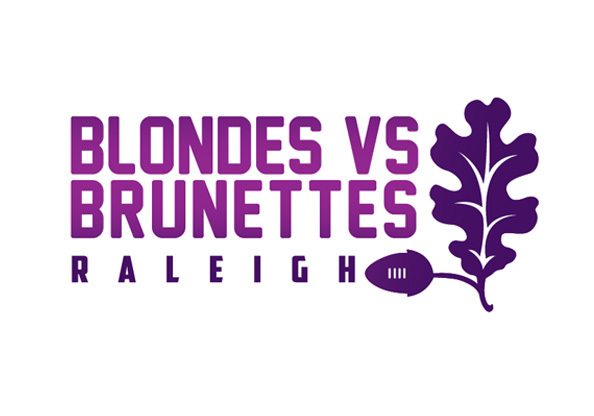 Following a successful second year of Alzheimer’s Association: Blondes vs. Brunettes Raleigh (BvB Raleigh), rivalries – blonde and brunette – will again hit the football field June 7, 2014 to help support the fight against Alzheimer’s. In 2013, BvB Raleigh raised over $50,000, exceeding the organization’s initial fundraising goal by more than $10,000. When: June 7, 2014; 10 a.m.
Up from its second-year fundraising goal of $40,000, Blondes vs. Brunettes Raleigh is working hard to reach a goal of $60,000 in 2014. To help support the organization’s fundraising efforts and ensure every penny raised directly impacts the Alzheimer’s Association Eastern North Carolina Chapter, BvB Raleigh is seeking the help of sponsors. Email BvBRaleigh@gmail.com for sponsorship information. Since its inception in 2005, this special charity has become a nation-wide campaign, spanning more than 25 cities across the United States, each hosting its own tumble of the tresses. To date, Alzheimer’s Association: Blondes vs. Brunettes organizations have raised a whopping $3 million for the Alzheimer’s Association, and continue to grow at a rapid speed throughout the country. 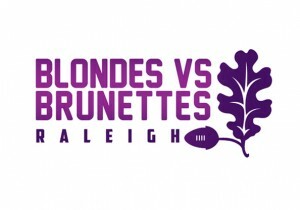 For more information, to donate to Team Blonde or Team Brunette, volunteer for fundraising events and game day, or become a sponsor, please visit www.bvbraleigh.org, “like” us on Facebook (https://www.facebook.com/bvbRaleigh) and follow us on Twitter (https://twitter.com/BvBRaleigh) and Instagram (@BvB_Raleigh). For media inquiries, please contact Sarah Styron at sarah@growafanbase.com. For any other questions, please email BvBRaleigh@gmail.com. 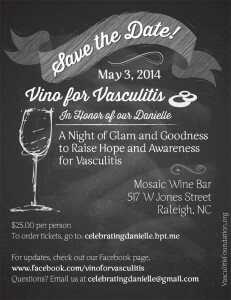 WHAT: A silent auction night of glam and goodness to raise hope and awareness for Vasculitis. 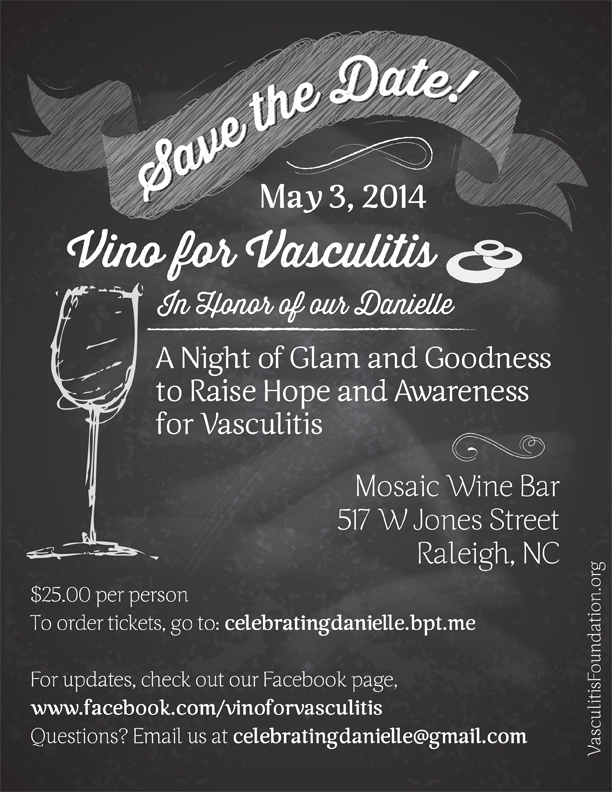 WHO: In conjunction with the Vasculitis Foundation, friends and family of NC State graduate, Danielle D’Haene, are planning the first annual Vino for Vasculitis silent auction event in her memory. WHEN: May 3rd, 2014 5:00pm until 8:30pm. WHY: The goal of the event is to raise awareness about Vasculitis as well as raise money to benefit the Vasculitis Foundation, an organization dedicated not only to the mission to research and develop new treatments in an effort to better treat, and hopefully one day, cure the disease but to the vasculitis patients and their family members. HOW: $25 tickets are being sold at celebratingdanielle.bpt.me and include entrance into the silent auction, a glass of wine from Mosaic, food, entertainment, and a night of memories and fun. MORE: Vino for Vasculitis was created by a group of Danielle’s friends dedicated to honoring her memory and raising awareness about these rare diseases that took her life. Our event has been 100% supported by our community so that we are able to raise as much money as possible for the Vasculitis Foundation. We could not feel more grateful and inspired by the outreach and support we have received.